The Scythe Mugen 5 Rev B SCMG-5100 heatsink is a lower-noise tower cooler standing 154mm tall and equipped with a single 120mm PWM fan. The Mugen 5 Rev B is constructed around six 6mm diameter nickel plated heatspipes which are swaged onto an array of raw aluminum cooling fins. Heat distribution shown via kapton tape adhered to the edge of the fins 10mm from top and bottom. Temperature increases by roughly 3C from left to right on the Mugen 5 Rev B as the moving air mass picks up heat. 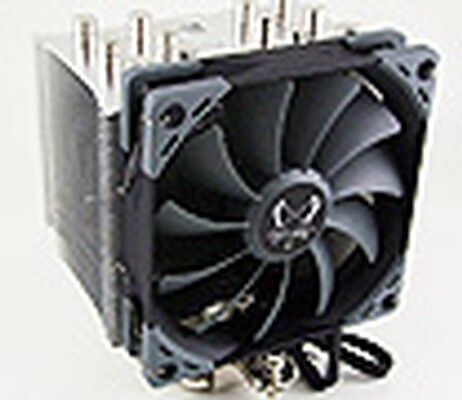 Scythe SCMG-5100 Mugen 5 Rev B Heatsink kaufen.